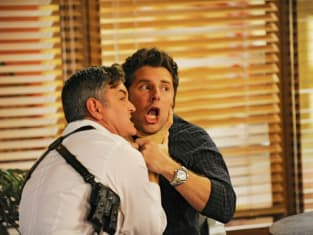 Let there be"No Trout About It: Psych season 7, save the musical episode on tap, has come an end. But this USA Network smash left leave us by not only delivering a string of deliciously flavored installments overall, but a rather fitting and rave-worthy finale as well. I loved this finale for a variety of reasons, among them the plethora of terrific lines. But it wasn’t the Psych quotes that stood out to me: it was the proof of how far Shawn, Gus, Juliet and Lassiter have come as a team. Go back two seasons... Shawn/Gus and Juliet/Carlton were two separate units, often operating in opposition to one another. Only thanks to Henry’s repeated and consistent efforts to push these teams together did they start to cohere during that time. Today, they are not only working cases, they are on a collision course to do so in every way, literally and figuratively. Shawn and Juliet are a couple; Shawn, Gus and Lassiter have reached a point in their relationship where Shawn and Gus can be part of Lassiter’s wedding party. They are the friends Lassiter said he didn’t think he had. Not only that, they mounted a concerted effort to re-construct the case and their investigation for Trout, even as they covered for one another's potentially compromising actions. One of their brightest moments took place when - despite the fact they had been suspended from the case - they banded together to get the bad guy anyway. But perhaps their greatest showing as a team was in their defense of their house, the SBPD. In the heat of the moment, they can be the most dysfunctional group of co-workers in the building. Lassiter strangled Shawn in front of Trout in a fit of anger over being doused with Leo’s ashes. But when you come into their house and threaten their people - like mascara on Prince - it is on. We really have to hand it to Chief Vick, though. I think we’ve finally figured out which way she’s leaned on the whole psychic thing from the beginning. Getting the bad guy became the sword she was willing to fall on time and again for these four to do what they do so well. That was made most plain in her allowing Shawn to hug her, and him being the only one allowed to do so. Part of me believes this is a nod to the fact that it was Shawn’s efforts that allowed her to keep the job that the previous mayor had no intention of letting her retain. His private investigating scandalized the other candidate vying for the gig. This was likely the point at which the Chief decided that his antics, his results, were the price she was willing to pay to allow him to continue when the time came. Chief Vick’s sacrifice was much greater in that it saved the jobs of the team she poured so much into even at the expense of her own six-month suspension. Yet even her sacrifice wasn’t enough to keep them together, as Trout decided he would no longer be hiring psychics and he demoted Carlton from his position as Head Detective. And it certainly didn’t save poor Buzz from being humiliated and then fired by Trout himself. Even so, the unit gave Trout a piece of their mind and defended Chief Vick in the process. That’s what makes this one of their best season finales. Not because of the drama, but because it demonstrated the trajectory these four have been on towards each other from the beginning, and what that trajectory is going to make them capable of in the future, especially in the face of a mutual enemy. Though we’re left with tons of question, rest assured the fan-fiction world will begin resolving these wide open possibilities. Henry meeting Felicia at the Memorial Day Run, kinda want to see where that goes, if anywhere. Silence making Gus uncomfortable in a legit way. Shawn dropping the ball about him and Juliet to Trout. Lassiter ratting out McNab’s side job to Trout to cover up his own perceived improprieties. Consecutive Dinners and lunches including shaved ice cones. So... do you think we’ll ever see Karen again? How long do you think Trout will stick around?